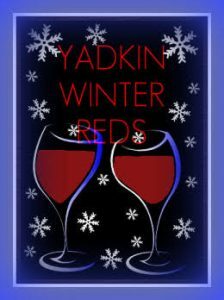 Ninth Annual “Yadkin Winter Reds” wine event will be held January 27 – 28, 2018 and February 24 – February 25, 2018. Enjoy two weekends of wonderful wine, food and entertainment in Yadkin County. Looking for a day trip or a weekend getaway, then come visit Yadkin County and enjoy the annual Yadkin Winter Reds Event sponsored by the Yadkin County Tourism Development Authority. This is a great opportunity for you to visit Yadkin County wineries and taste the excellent wines that are being produced. All Yadkin County wineries will feature their “Winter Red” (2 oz. pour) paired with a 3 oz. serving of a tasty food item. The hours will be Saturday Noon to 5 pm and Sunday 1 pm to 5 pm. Each ticket holder will be assigned to a starting winery where they will receive their Riedel wine glass and a map. Ticket is good for both days on the selected weekend you choose – one visit per winery. Limited ticket event for both weekends. Yadkin Winter Reds Wine Dinners will be held on Friday, January 26th & Friday, February 23rd at Jasper’s Restaurant at Sanders Ridge Vineyards. Both wine dinners will begin at 6:00 p.m. This is a limited ticket event!